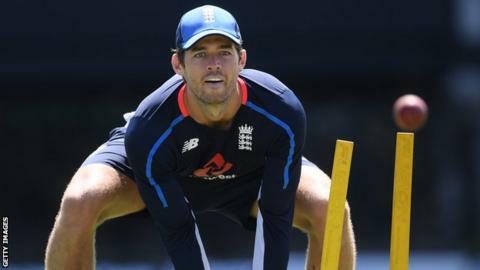 England have dropped wicketkeeper Ben Foakes and recalled Keaton Jennings for the final Test against West Indies, which begins on Saturday. Foakes, who did not keep in the second Test after injuring his hand, was fit to play in St Lucia but has not been named in the 12-man squad. Opener Jennings was dropped for the second Test in Antigua for Joe Denly. All-rounder Ben Stokes, who missed Thursday’s training with a bruised heel, has also been included. Jonny Bairstow, who has batted at three since Foakes made his debut in November, will keep wicket. Seamers Mark Wood and Sam Curran have been named in the squad, but Chris Woakes was not available for selection because of a knee problem. West Indies have an unassailable 2-0 lead after their emphatic 10-wicket victory in Antigua. How worried should we be about England’s form? Foakes made a century on his Test debut in Sri Lanka but has registered scores of two, five, 35 and 13 on the Caribbean tour. Jennings has played 16 Test matches at the top of the order for England and averages 25.86 with the bat. His inclusion means Denly, who opened with Rory Burns in Antigua, could move to three, with Bairstow batting lower down the order. “We came away this winter trying to do things differently and find ways of winning away from home,” captain Joe Root told BBC cricket correspondent Jonathan Agnew. “We had great success in Sri Lanka [where England won 3-0] and it’s not quite materialised here. England arrived in the Caribbean having won eight of their previous nine Tests but it has been a disappointing tour, particularly for the batsmen. Root’s side have suffered batting collapses in all four of their innings, including being bowled out for just 77 in the first Test in Barbados, before losing the second Test inside three days. The 28-year-old said England were “desperate to come away from this tour with something”. “It’s very easy to spend loads of time on individual aspects but you have to be very honest with yourself and where you can get better,” Root added. England have only the final Test against West Indies and a four-day Test against Ireland in May to prepare before the home Ashes series against Australia starts on 1 August. There will be a lot of sympathy for Foakes, who has barely put a foot wrong and done a lot right since his call up in Sri Lanka. But with Bairstow and Jos Buttler both compelling selections, a specialist wicketkeeper batting at eight was a luxury. Bairstow returns to the role he has excelled at so the only gamble is on Jennings, who seemed to have been sent into the long grass. Wood gives the attack some bite and the only injury concern is Stokes, who will be assessed again in the morning. If he is ruled out, Sam Curran will play. England squad for the final Test against West Indies: Moeen Ali, James Anderson, Jonny Bairstow (wk), Stuart Broad, Rory Burns, Jos Buttler, Sam Curran, Joe Denly, Keaton Jennings. Joe Root (c), Ben Stokes, Mark Wood.